Astronomers knew of five moons before the Voyager 2 spacecraft launched in 1977. The probe found an additional 10 when it swung by the system in 1986. "When [Voyager 2] flew past in 1986, it was winter and dark on the whole northern hemispheres of all the moons, so we could only see a portion of their southern hemispheres," Jeff Moore, a planetary scientist at NASA Ames Research Center in California, told Space.com. "The encounter was also a bit like flying through a bull's-eye. Rather than one moon at a time, [Voyager 2] encountered the whole system at once." No spacecraft has gone to Uranus since then, but astronomers have found new moons with the aid of generally improving telescope technology and techniques. The latest discoveries — Mab, Cupid and Margaret — were confirmed in 2003. 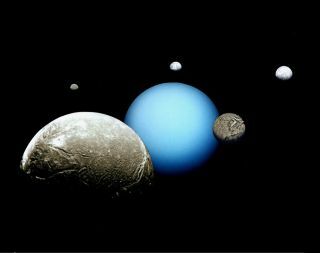 The moons of Uranus may have formed from the collision that knocked the planet over on its side. "Material from the two [colliding] bodies is ejected in a debris disk, and finally satellites are formed from the debris disk," researcher Yuya Ishizawa, of Japan's Kyoto University, told Space.com. "It is possible to explain the axial tilt and the formation of the regular satellites of Uranus simultaneously." The discovery of Uranus and its first two moons came from the same astronomer: William Herschel. The English skygazer found Oberon and Titania in 1787, just six years after discovering the planet itself. Close-up pictures two centuries later showed that Oberon is about half ice and half rock, with craters peppering its surface. Titania has fault lines running across its surface, hinting at past or present seismic activity. Most of the other moons were so small and far away from the spacecraft that little is known about their composition and in some cases, their sizes. Belinda and Cressidahave low reflectivity, indicating they are probably carbonaceous moons as Puck is. The other moons found right away were Portia, Rosalind, Juliet, Desdemona and Bianca. A 2001 study using the Hubble Space Telescope suggested these satellites (called the "Portia group" in this study) all have similar compositions and orbits. Three more discoveries happened in 1999 using the Canada-France-Hawaii Telescope at the Mauna Kea Observatory: Setebos, Prospero and Stephano. In 2001, a team at the Cerro Tololo Inter-American Observatory in Chile found Trinculo, Francisco and Ferdinand. With no spacecraft visiting Uranus in the near future and its sheer distance from the Earth, the potential for observations of its moons is limited. That said, there have been several scientific examinations of the system in recent years, as well as proposals to send spacecraft there in the distant future. Some astronomers envision using small cubesats to reduce the cost of getting a spacecraft out that far, while still returning valuable science. A team also submitted a Uranus Pathfinder orbiter mission concept to the European Space Agency in 2010, and again in 2015, but neither concept was accepted for funding. Separately, a 2014 model of Miranda in the journal Geology suggested that its strange surface could at least in part have come by tidal heating, which created slow convection on the icy surface. "Miranda has a really bizarre, deformed surface," Noah Hammond, a planetary scientist at Brown University in Rhode Island, told Space.com. "It's a really beautiful and exotic moon." The thin rings that surround Uranus hint that the planet could have even more moons in orbit. "At the edges of the rings … it's almost like the amount of stuff is going up and down in a periodic fashion that looks kind of like a wave, with crests and troughs," then-graduate student Robert Chancia, of the University of Idaho, told Space.com. "It seems consistent with something disturbing the rings there," he added. "Based on the amplitude of this wave pattern and that distance from the ring … and our attempts to find the moon in images, it basically points toward if they exist, they're pretty tiny," Chancia said. He estimated that the moons, if they exist, are likely smaller than 3 miles (5 kilometers) in radius.